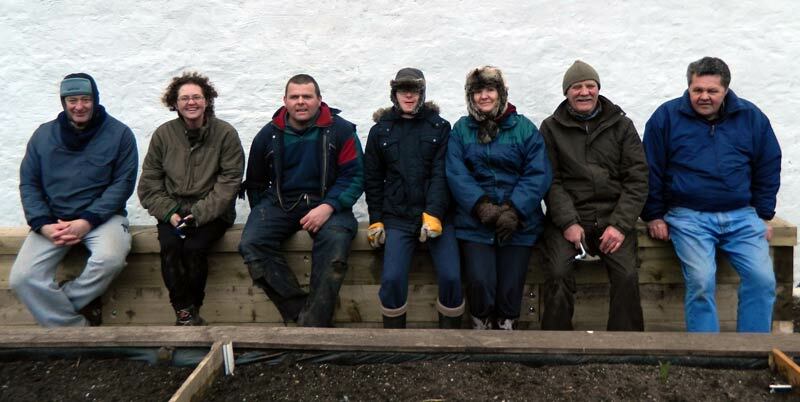 If anyone is interested in managing a small allotment space can they please send an email to chairperson@girvancommunitygarden.com or call 01465713439 leaving your name and contact number and we'll get back to you. There are 3 plots available and they are free of charge. 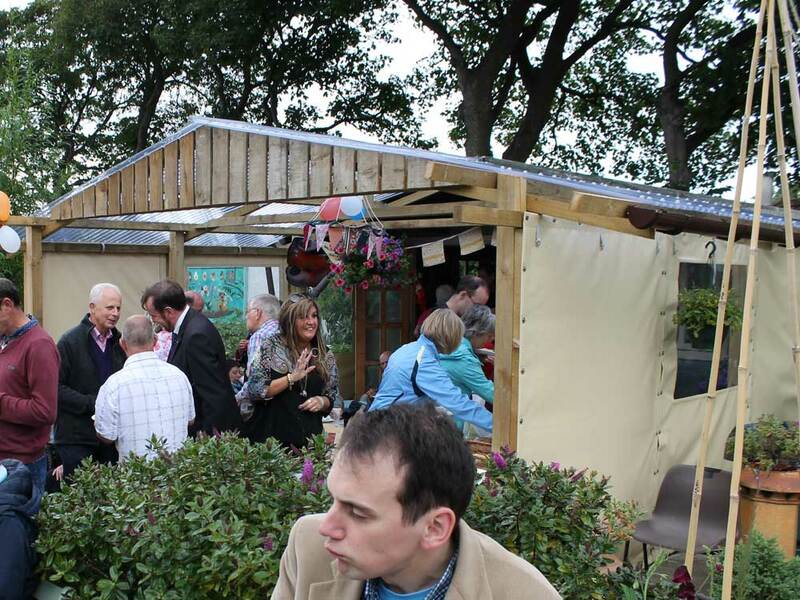 Girvan Community Garden has received funding from Ayrshire Leader to purchase a new waterproof tented cover for use during events. The tent is a Stretch tent and can be used in many different ways. 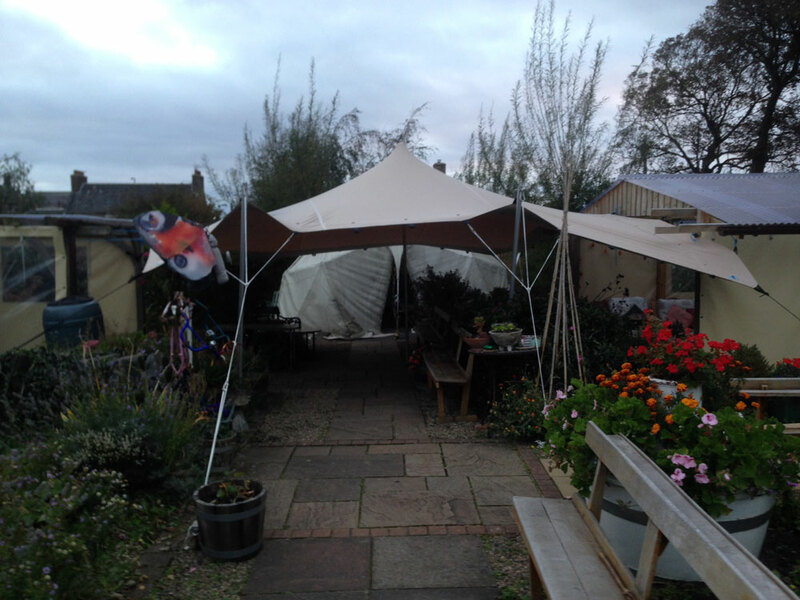 Our team of volunteers gave it an initial pitch at the Harvest Festival and it provided some much needed shelter on what was a very cold day. 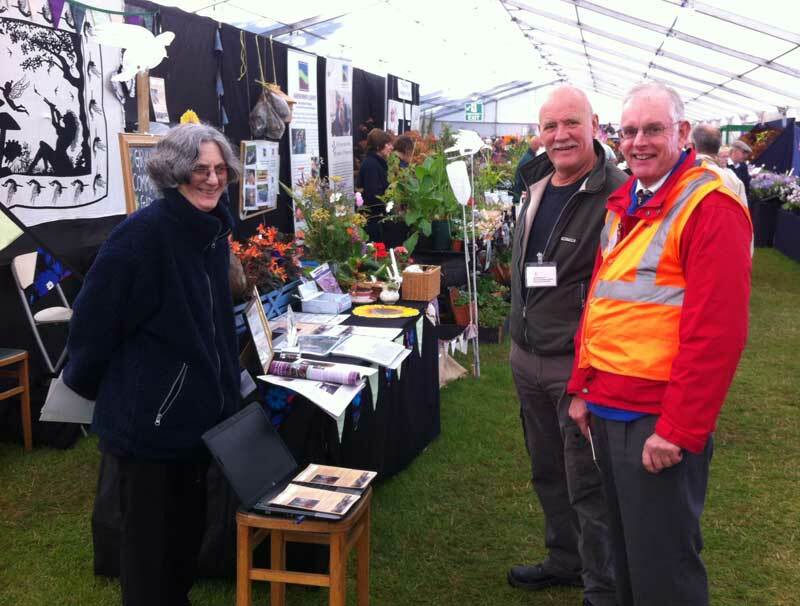 New and old friends and volunteers celebrated the gardens 10th Anniversary on the 24th of June. We were delighted to see everyone having a great afternoon. Guests were treated to a wonderful buffet feast, cake, complimentary drink and music. Certificates of appreciation were given to our longest volunteers, Audrey Riddell and Ward Higgins. To mark our 10th anniversary we launched a new logo competition involving 3rd year Girvan Academy pupils. Rachel Roxburgh was our winner and she received a £50 voucher for art materials. Thanks goes to Alec Clark and Etta Auld for their kind words. Later on the garden opened up to the public. We were humbled by the amazing comments that everyone had about the garden and how it has developed over the years. Thanks also go to those who sent cards and gave us donations. 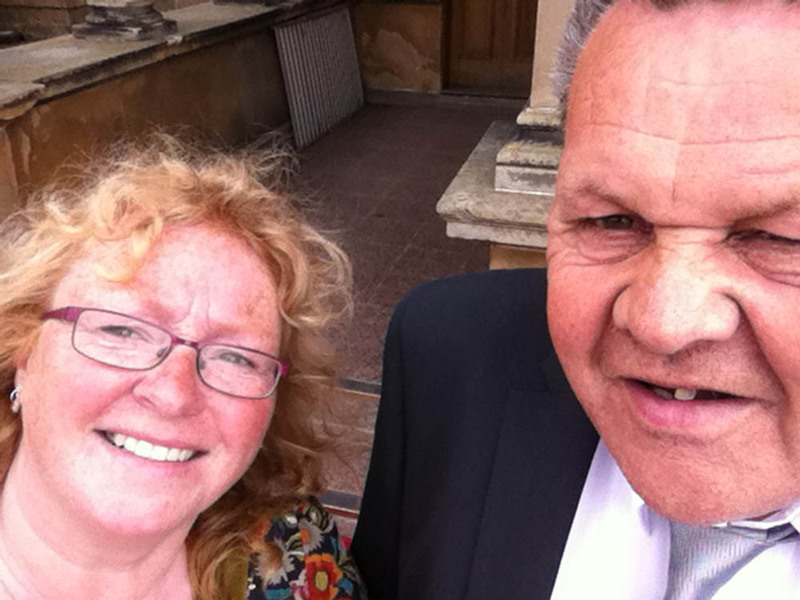 Some people couldn't make it to the party but you were all in our thoughts while we raised a glass of bubbly! 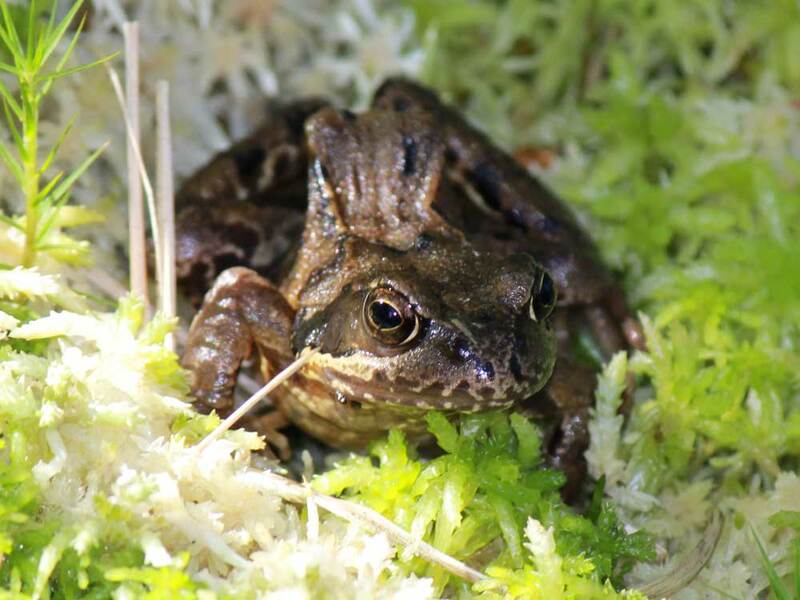 Our pond is thriving with frogs at the moment. 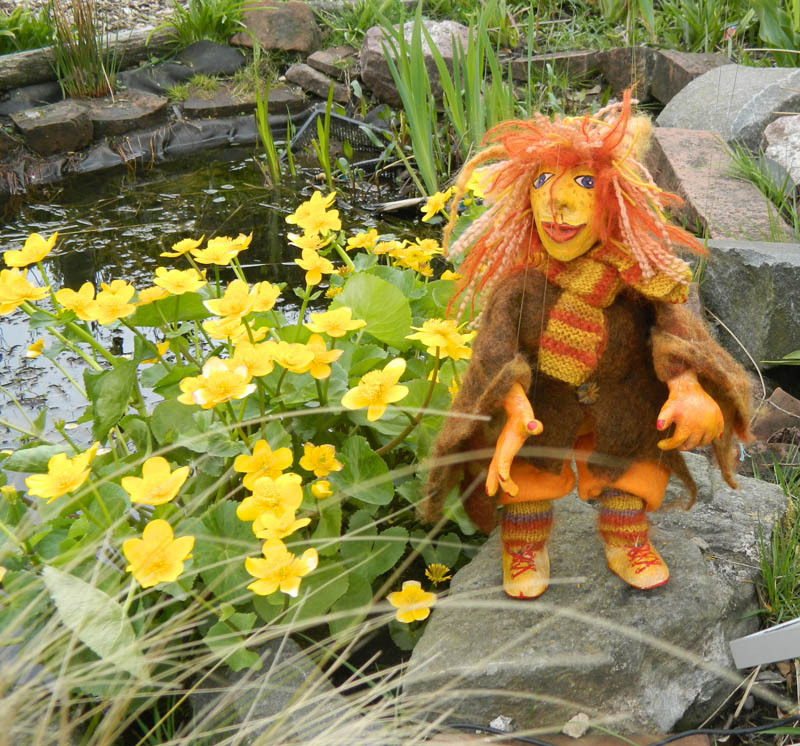 They have migrated from the warm corners of the garden and are gathered in the pond. They are mating and can be heard singing. 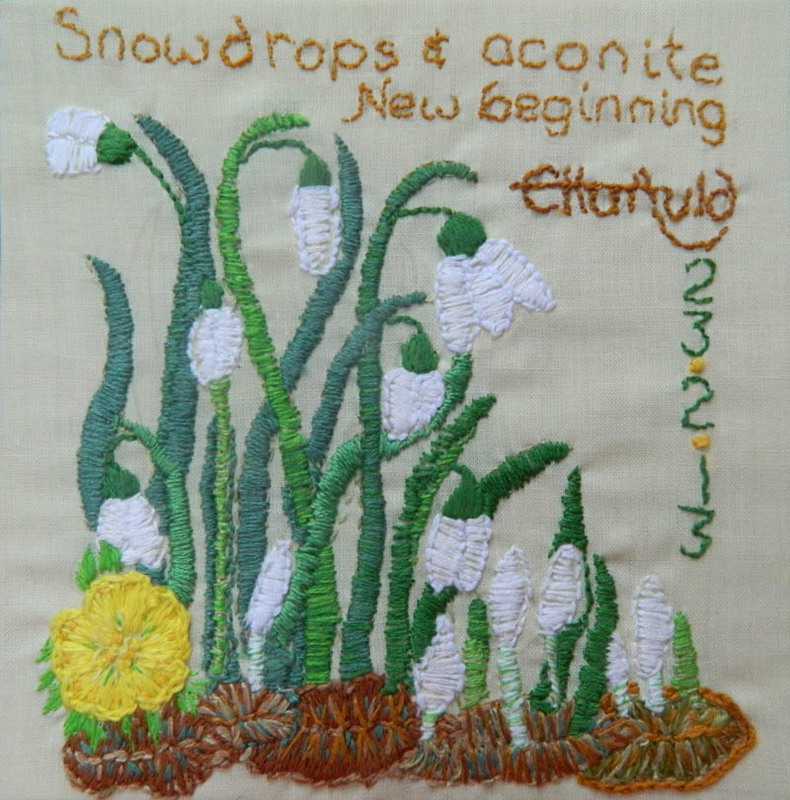 This lovely calendar event will only last a week so be quick and come and see and hear them. 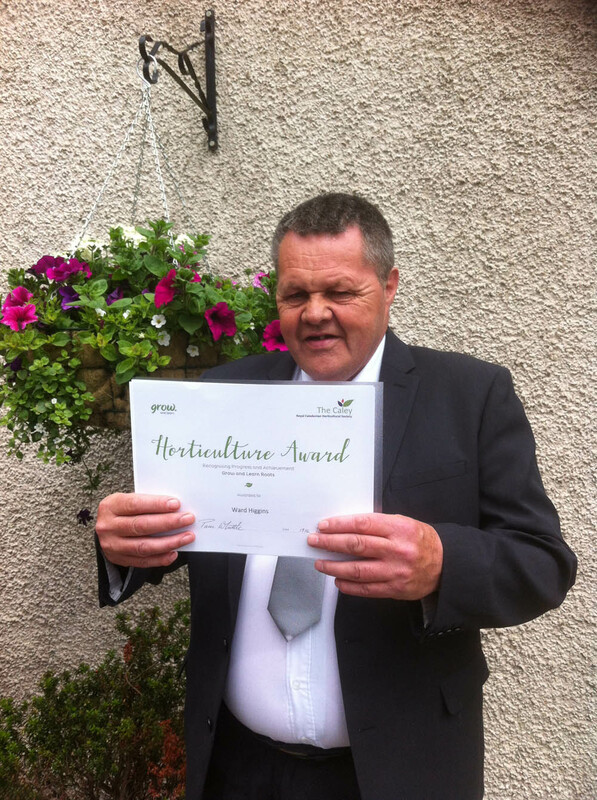 A huge congratulations to Gordon Prentice from the Carrick Opportunities Centre who successfully completed the Roots Horticultural Award from the Royal Caledonian Horticultural Society (The Caley). 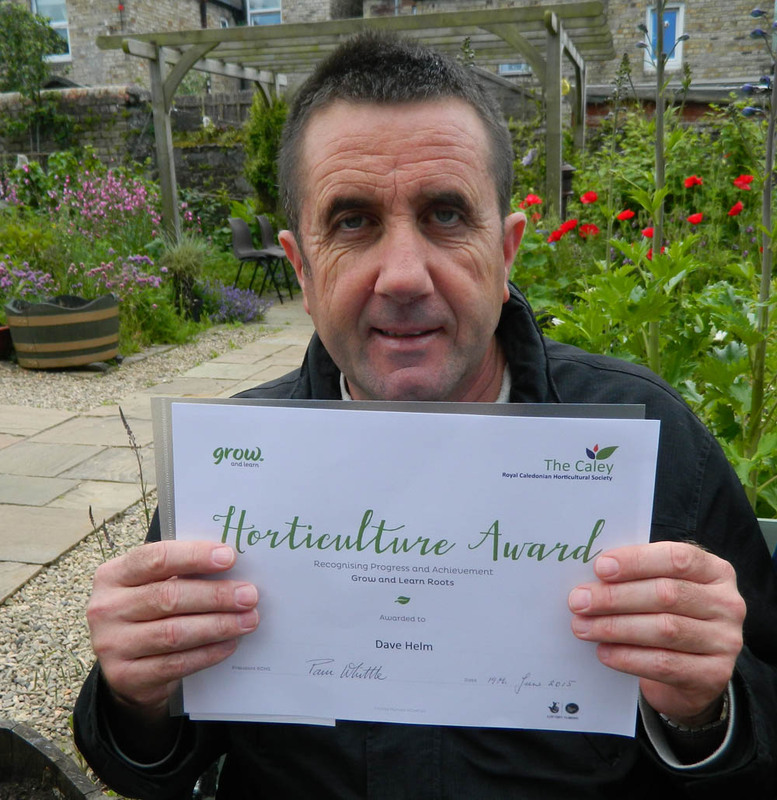 Gordon recently completed over 80 hours in the community garden and has built up a lovely portfolio as a record of his new skills and achievements. 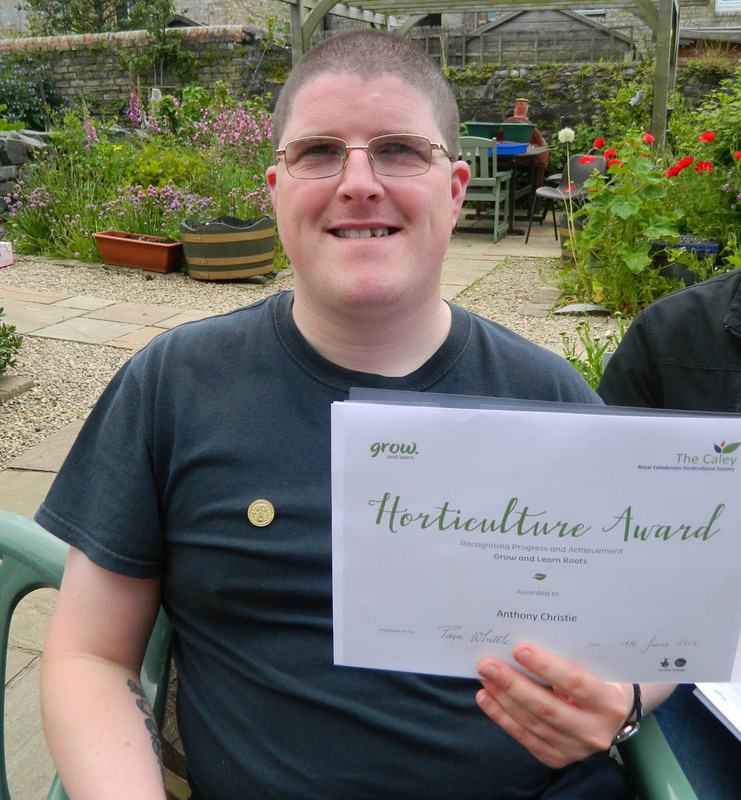 We were able to have a wee tea and cake party for him in the garden with fellow volunteers and friends to receive his certificate. What a Mad March Easter week we have had! 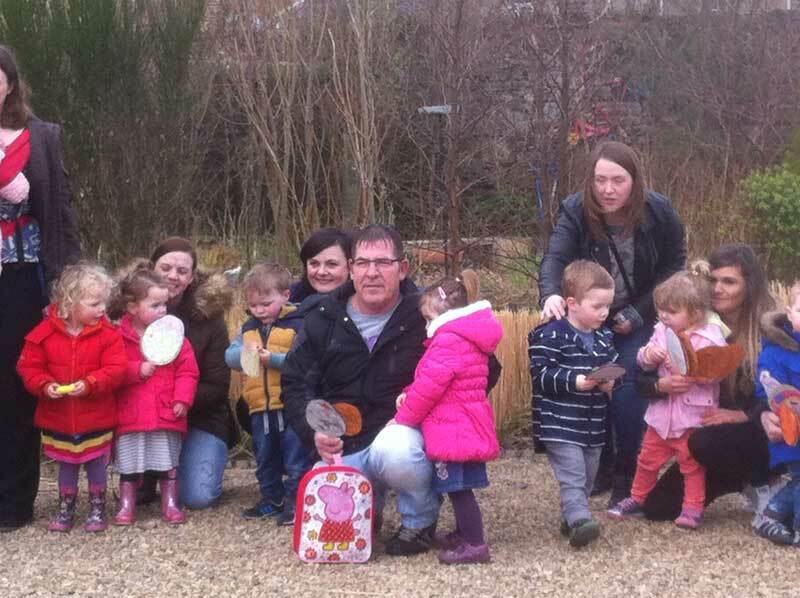 We kick-started the Easter week with a visit from Girvan Playgroup who went in search of some Easter ‘eggs’ hidden around the garden! Thanks to Nestle who supplied us with some lovely treats for them! Then on Saturday we had horrendous weather, however, we decided to carry on with the children's entertainment. The show must go on! 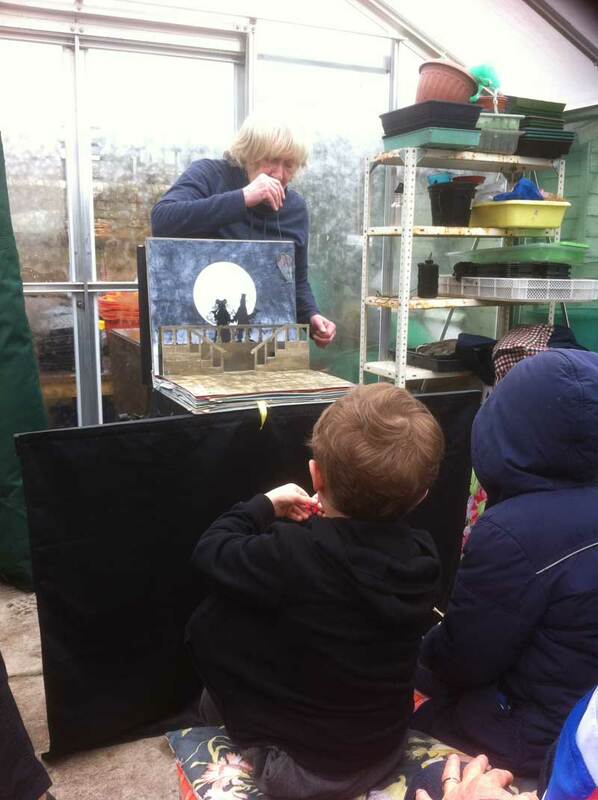 We were treated to an amazing paper theatre show from Colleen Magennis called ‘Who Will Marry Mrs Mouse’ and she performed it beautifully in the greenhouse. 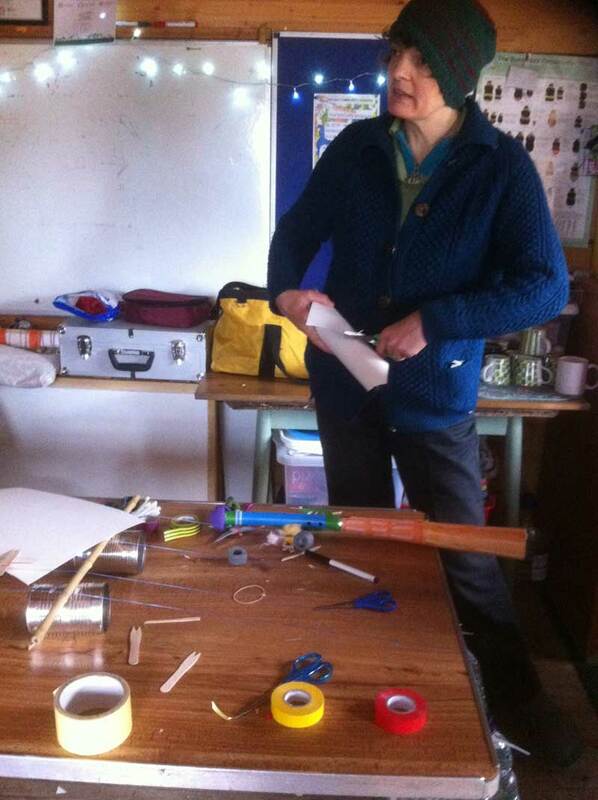 We had Sarah Kenchington, a truly amazing inventor of musical instruments who made paper and pipe saxophones and created a table top ‘guitar’ from bottles filled with water and string! 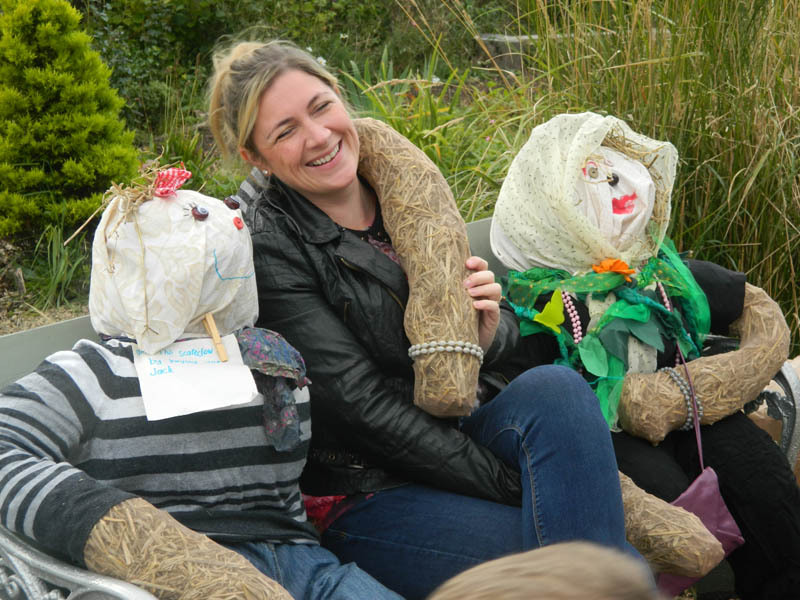 To top all that Shane Connolly brought his gorgeous Little Fawn Caravan Theatre into the garden where the children created their own puppets and starred in their own show! Brilliant! 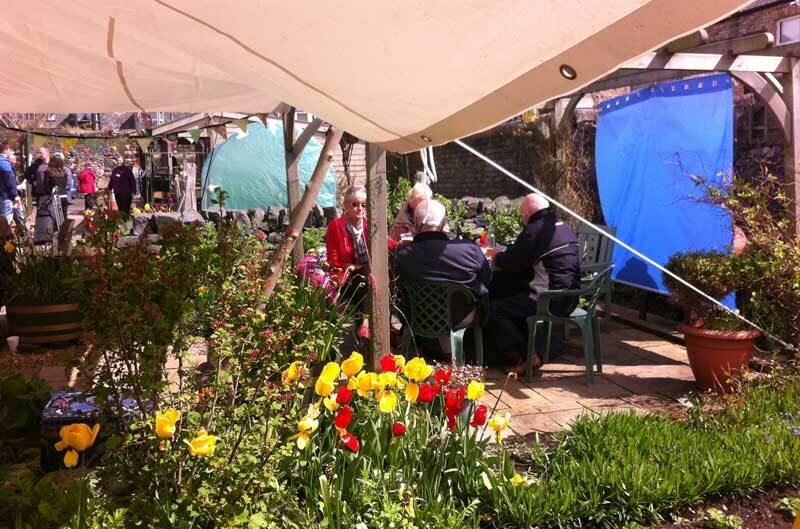 On Sunday the weather was a little kinder so the Easter quiz was set up around the garden and the children had to find the ‘eggs’ and answer a question. They all got a goody bag for completing the quiz. Thanks to the Sweetie Shop who supplied some of the chocolate treats! A big thank you to the Barrstools once again for the toe tapping songs and AmyJade for her beautiful singing! 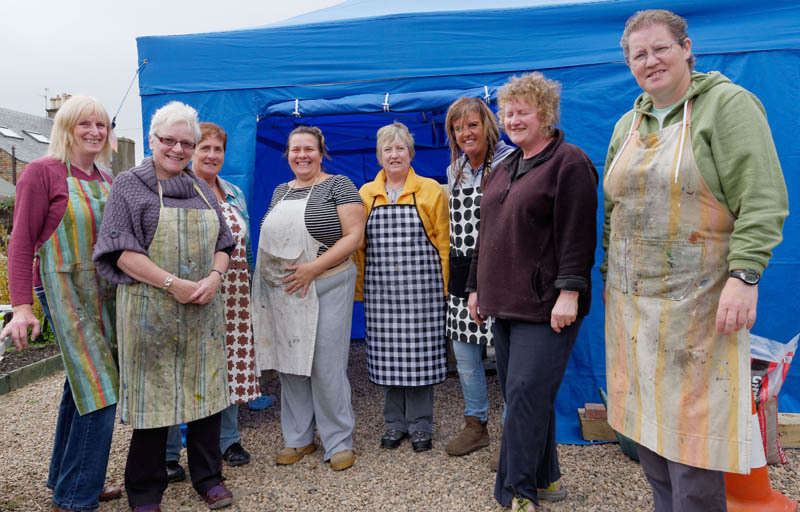 Also to our wonderful volunteers who baked lovely cakes and scones and helped out on both days! 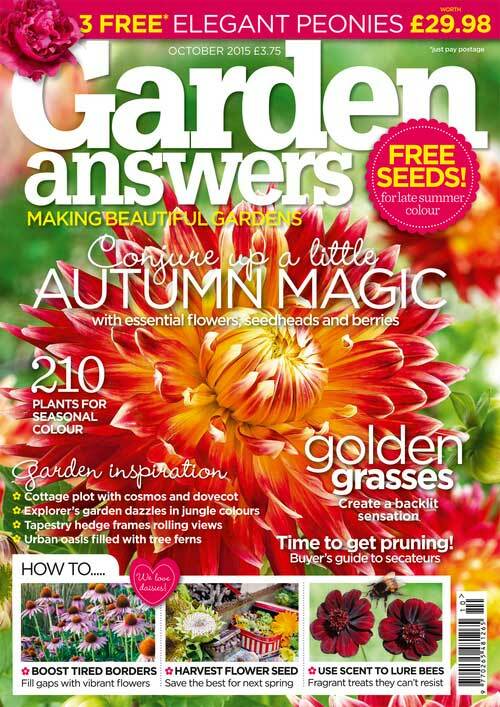 Girvan Community Garden is feaured in this months ‘Garden Answers’ gardening magazine as the community garden of the month! We are really proud to be part of it! 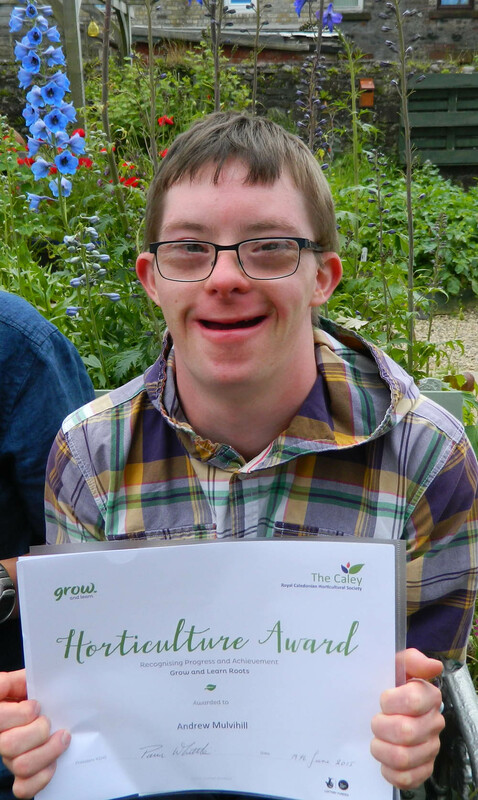 We hope that it will inspire other people to look at community gardening as a brilliant way of bringing people together and allowing people of all ages to be nurtured both physically and mentally. We are on page 100 so get your copy now! 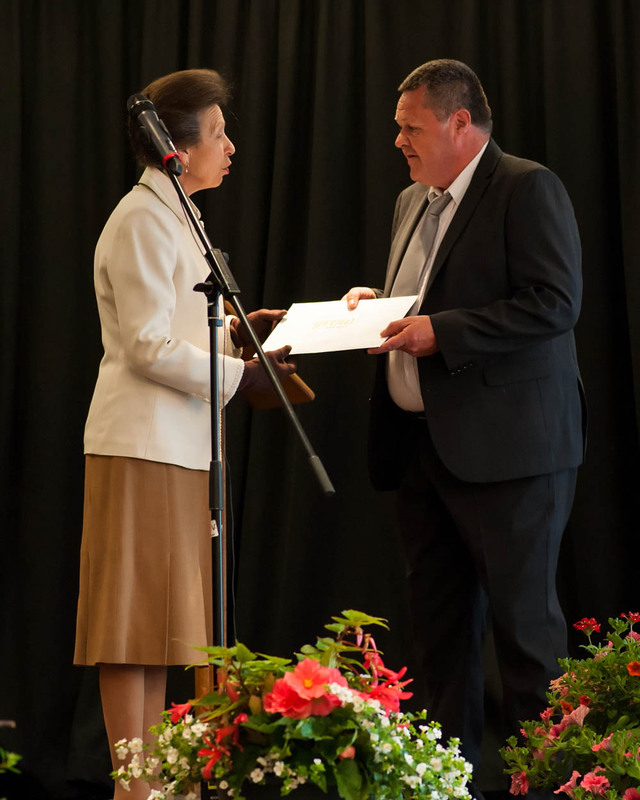 On Friday 19th of June 2015, Ward and Julie travelled to Norton House Hotel near Edinburgh to celebrate the Grow and Learn Awards run by the Caledonian Horticultural Society (Caley) in the presence of HRH Princess Royal. 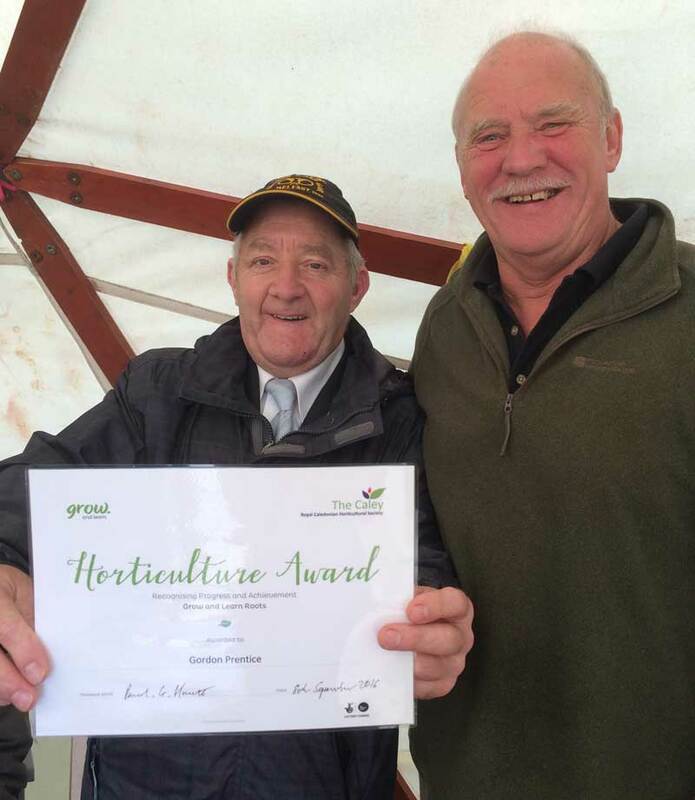 The Grow and Learn Award is a unique horticultural award that recognises individual personal achievement and progress. The award offers the learner a structured framework but is also flexible to accommodate the individuals needs. We were treated to a delicious high tea after Ward was presented by Princess Anne all of the certificates for his own achievement and for those who couldn't make it. 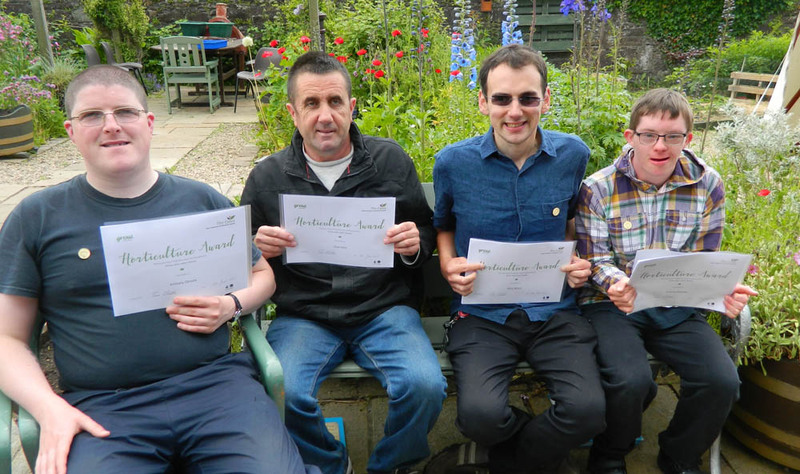 We decided to present the others with their certificates in the garden on Tuesday 23rd. The sun shone and Jim handed out the deserved awards to Dave Helm, Anthony Chrisitie, Marc Wilson and Andrew Mulvihill. They each were presented with their portfolios, a Caley pin brooch and their certificates watched over by friends and family. Well done guys! 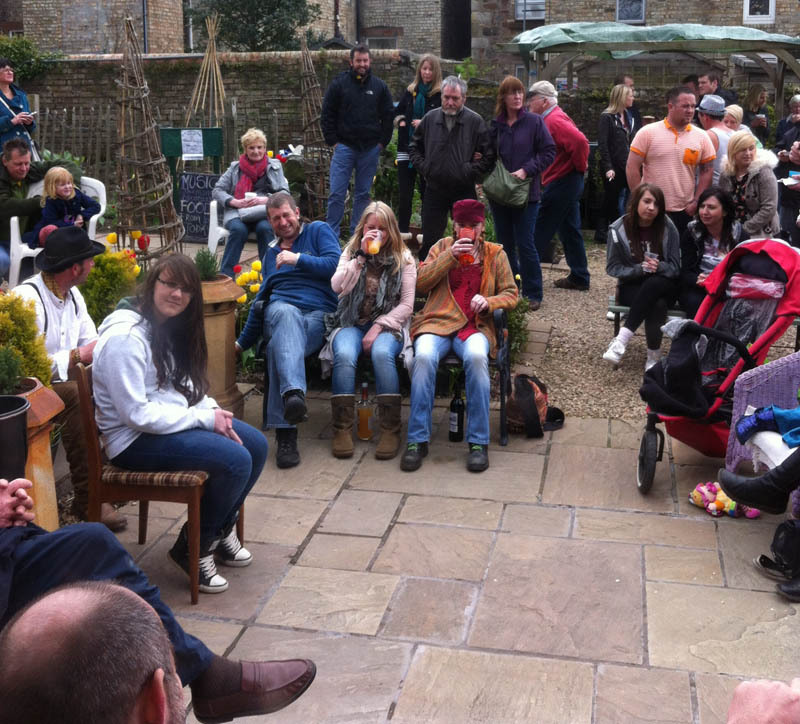 On Sunday (3rd May 2015) we played host to our annual ‘Folk in the Garden’ event to celebrate people, music and food. 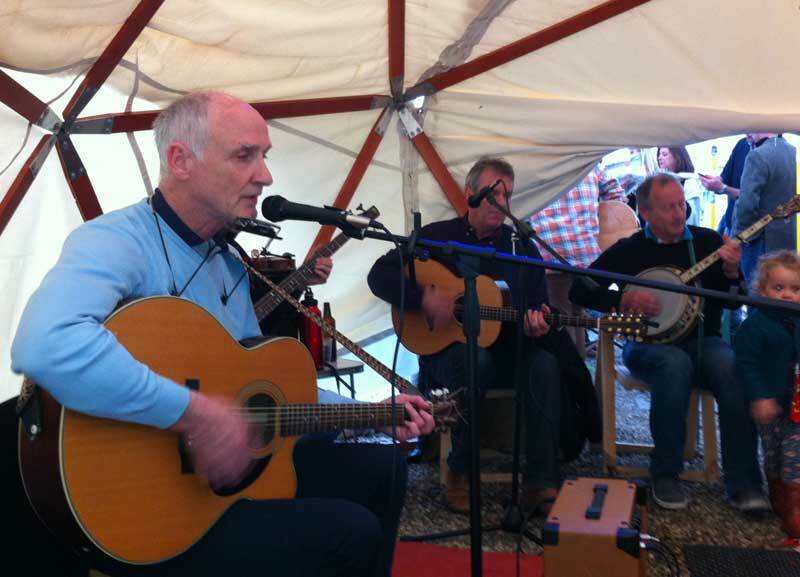 We had an exciting mix of musicians hailing from Edinburgh and Ireland to local lads who have jammed with each other over the years all coming together and giving the audience a wonderful mix of tunes over the day. 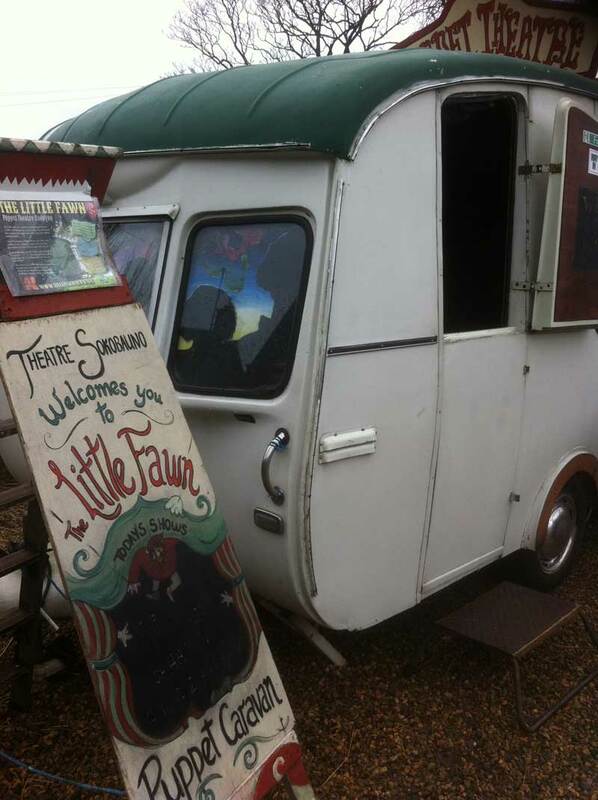 Families were treated to The Little Fawn Puppet Theatre masterminded by Shane Connolly who has converted a 1960's caravan into one of the smallest theatres you will ever visit. Children and adults alike saw the show ‘Weasel in Love’ which was full of laughs and a bit of heartache too! A huge thanks to the brilliant volunteers who gave their time before, during and after, to those who made massive pots of food and to United Beats Collective members for building the structures with us. See you all next year! 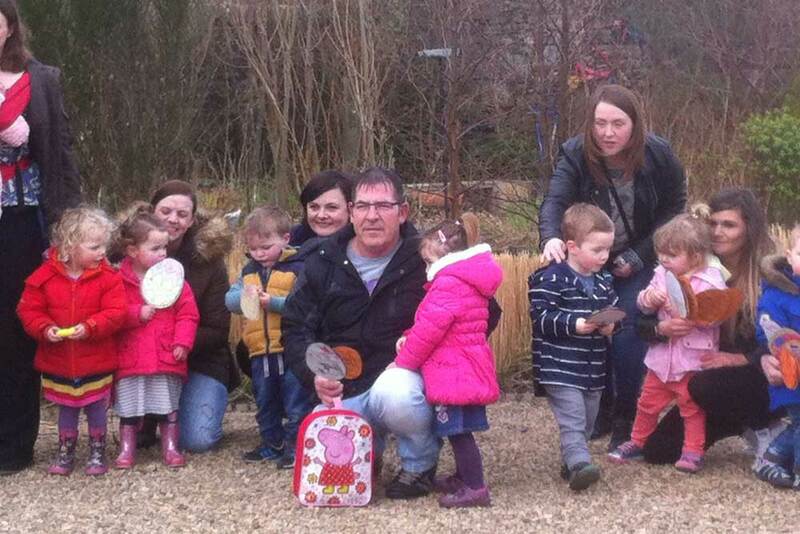 Local factory Nestle have also donated funding recently in order to improve our pathways around the garden. 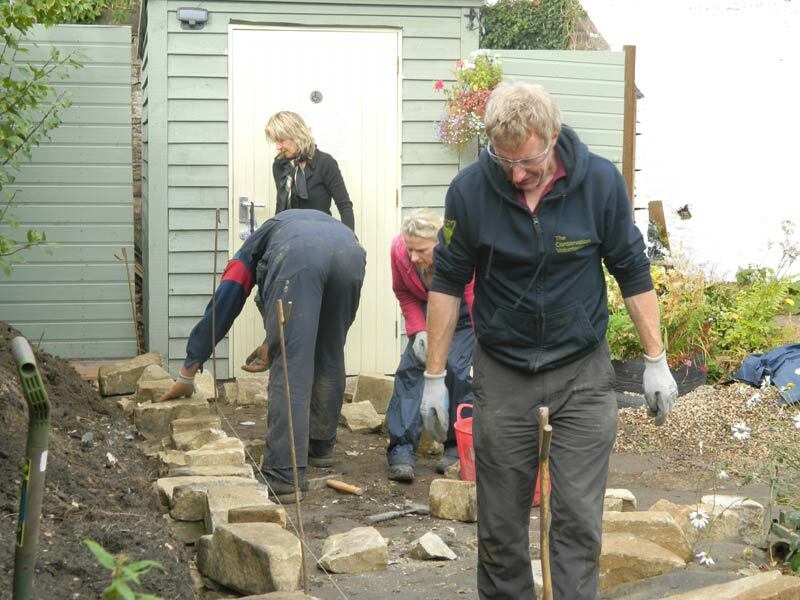 We were aware that last year some people had difficulty moving around the garden in wheelchairs and prams because of the gravel paths. Thanks to Nestle this problem has been resolved and we can assure all our visitors and groups that the garden is now totally accessible to everyone. Nestle employee Michele came along to inspect the work being done. 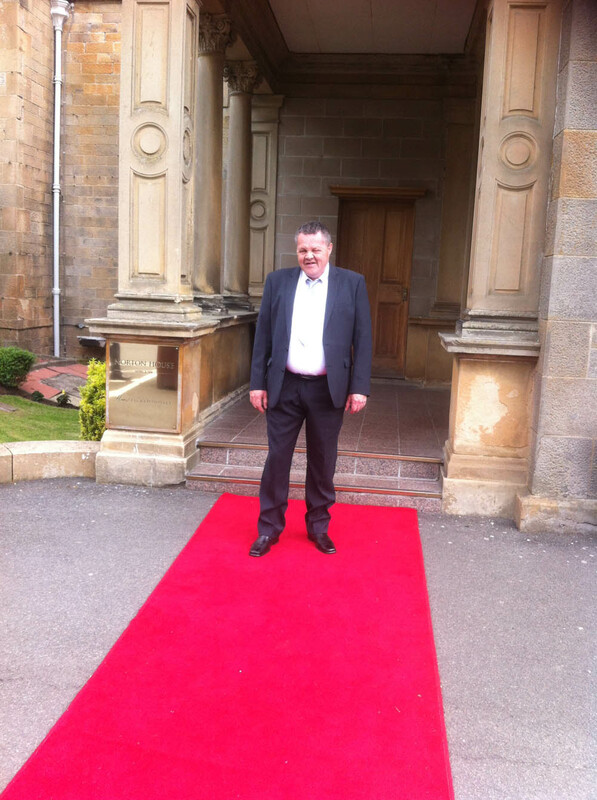 Our thanks also goes to Simon McCartney who has been carrying out the work for us while dodging the rain! 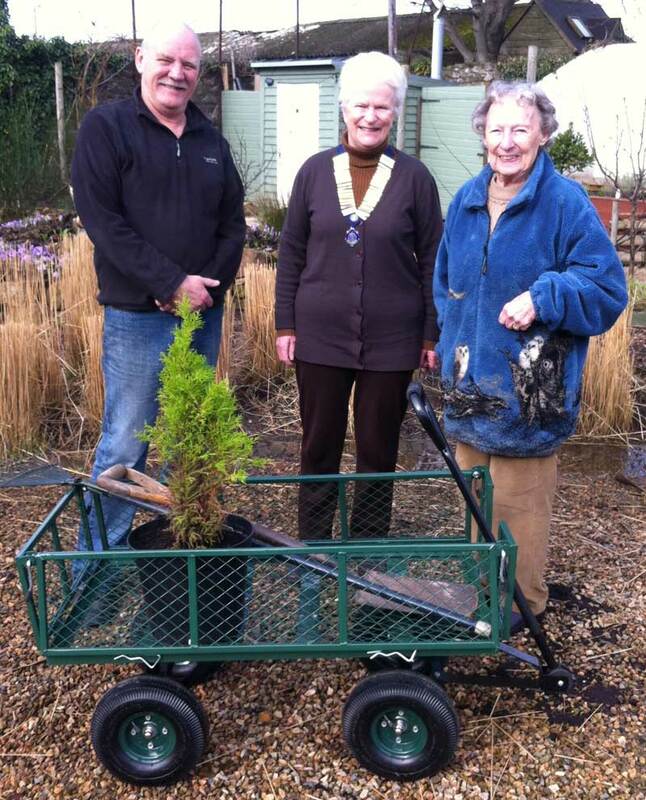 President Mary Ballantine of The Inner Wheel and member Betty Richmond came along to the garden recently to look at our newly purchased four wheel barrow. The International Association is celebrating its 90th anniversary and to mark the occasion all UK clubs are making a donation to their local communites relating to wheels. We are delighted that the club thought about us and we wish to say a huge thank you to them. 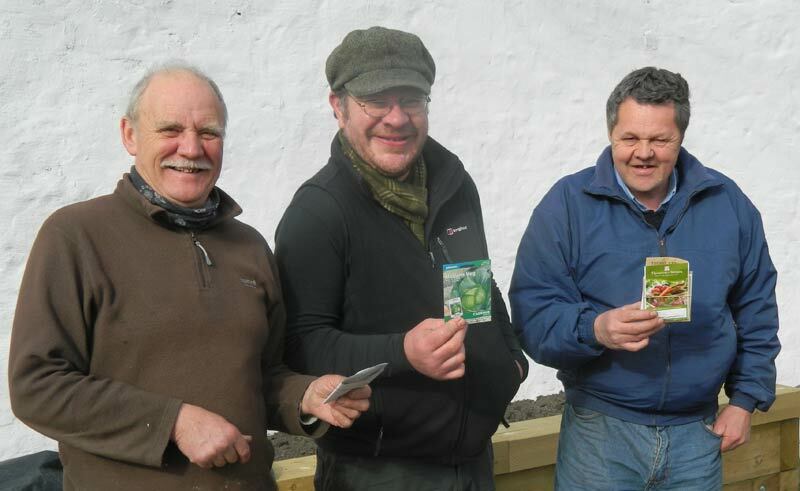 Veterans and Staff from Gardening Leave at Auchencruive in Ayr were invited to the garden this month (Nov) to sow poppy seeds but not just any old poppy seeds! 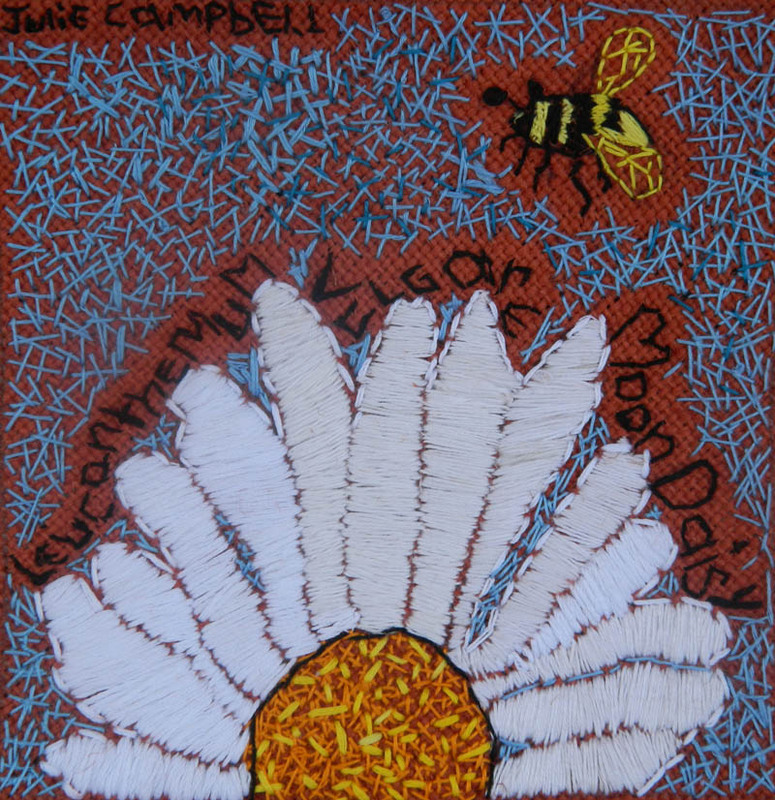 The seeds were dontated by the local Coop Funeral Service to sow in honour of the centenary of World War 1 in 2014. 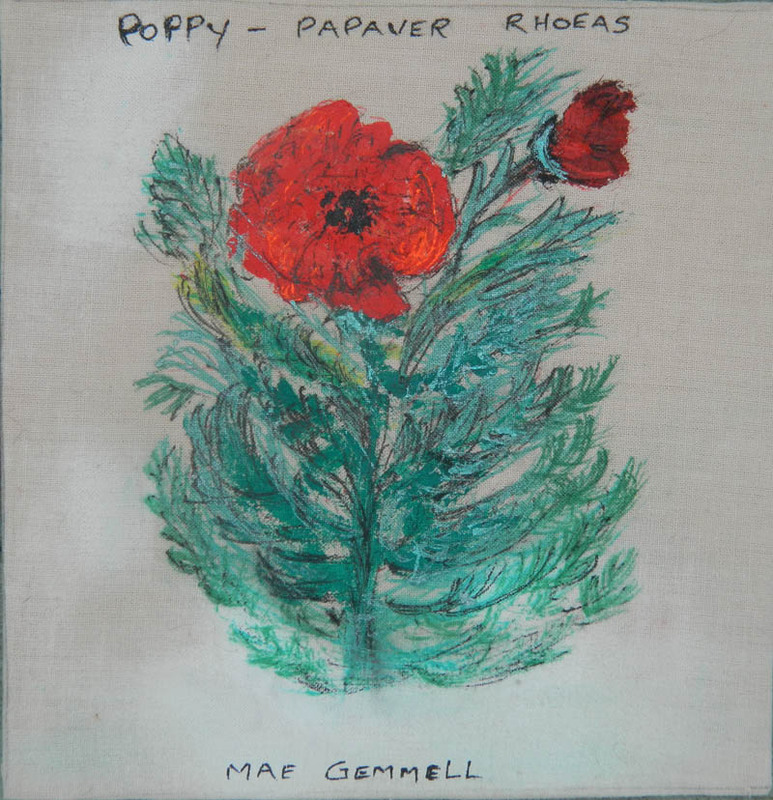 So, in the late spring /summer we hope to have a beautiful mini meadow of scarlet poppies that all the community can come and see and pay homage to those who gave their lives. Over the last month we have been saving seeds like mad. As the plants go past their best we were on a mission to collect as much seed as possible and to pass them on to the local community. 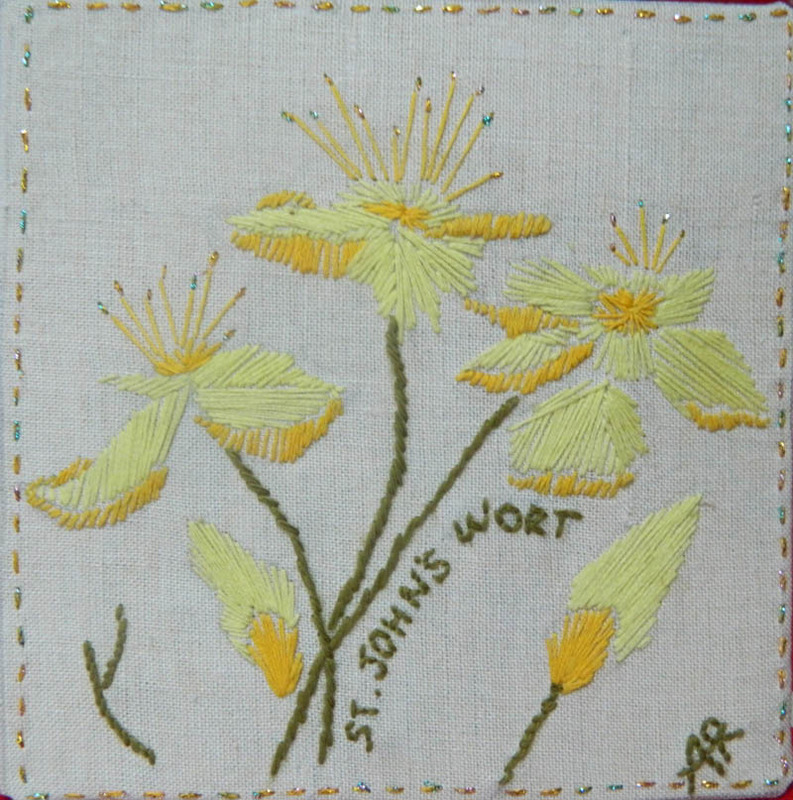 We also hoped to encourage other people to collect their own seed from their gardens which they could swap with us. Cue our first Seed Swap event. To make this event even more special we were delighted to get a visit from The Seed Truck which is part of the Fife Diet hot from their Summer Tour of Scotland. 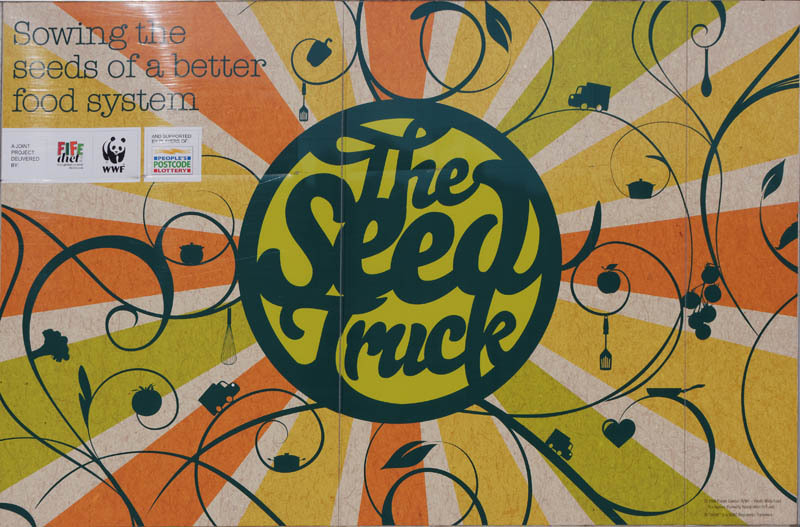 The Seed Truck project is supported by players of the People's Postcode Lottery and set up in collaboration with WWF Scotland. 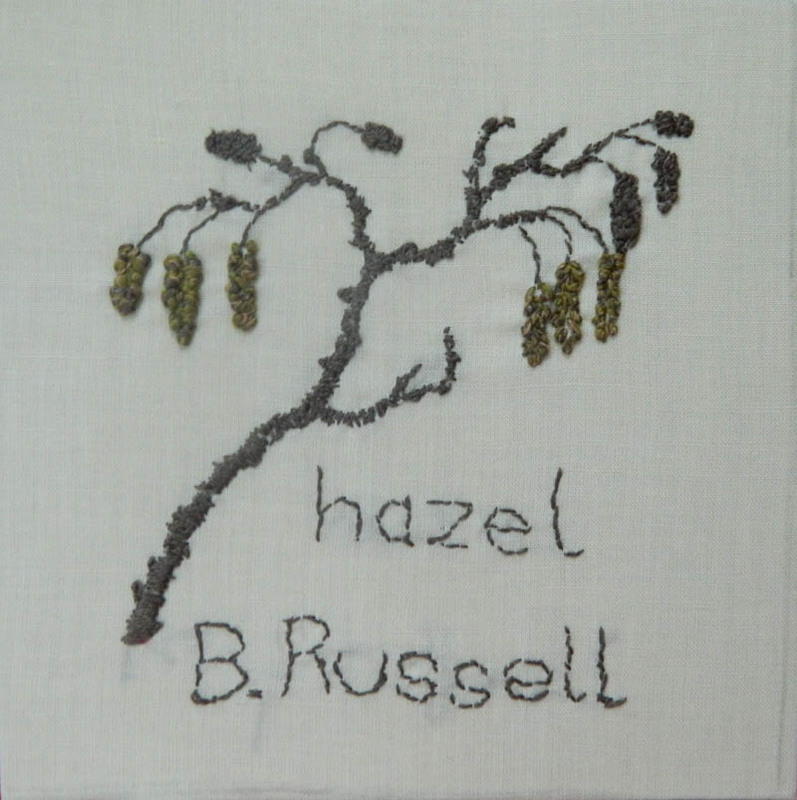 We had collected bambles and elderberries for Elspeth to make her herbal remedies. We tasted some really simple but delicious concoctions for preventing colds and congestions for over the winter months. ‘Mrs Mash’, the storytelling cook, was also on hand to entertain the younger visitors and Fergus gave us all a tune on his pipes! 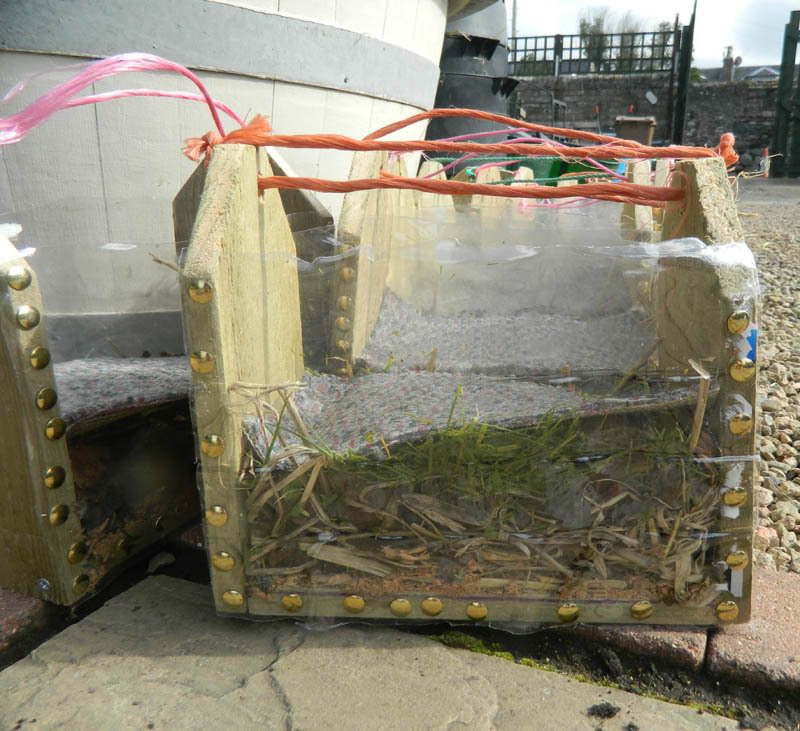 The Seed Truck opened up their own Seed Kist treasure box with lots of lovely seeds inside to swap. 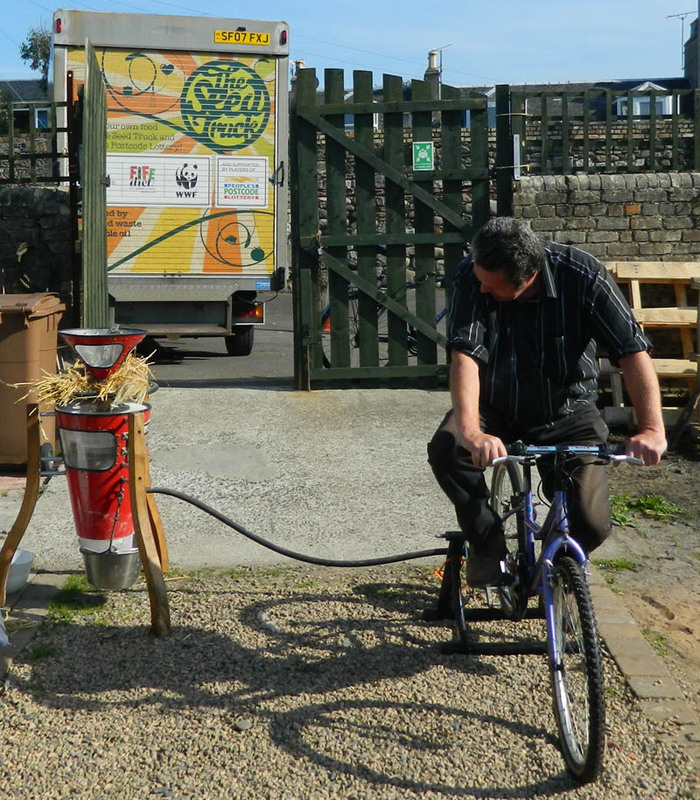 If that wasnt enough you could have a go on the mill bike by peddling as hard as you can to grind down the seeds into flour for you to take home! Brilliant. 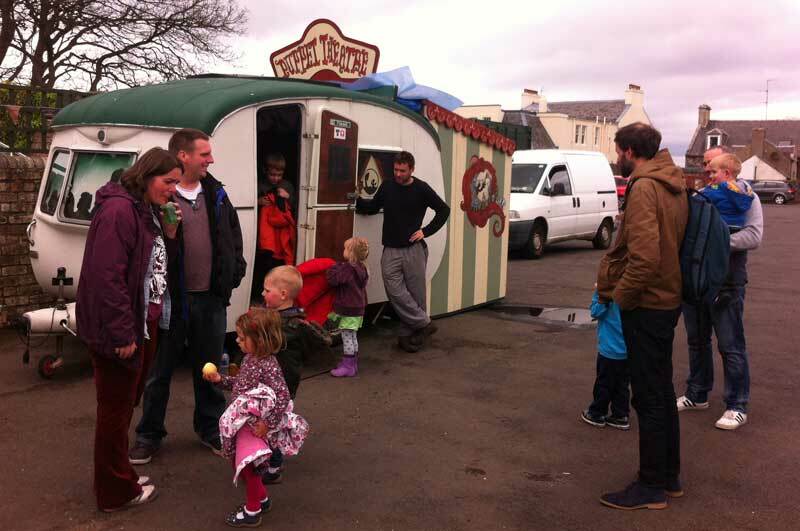 The sun shone brightly for our event and we had lots of visitors and swappers. Thank you to those who contributed their seeds. 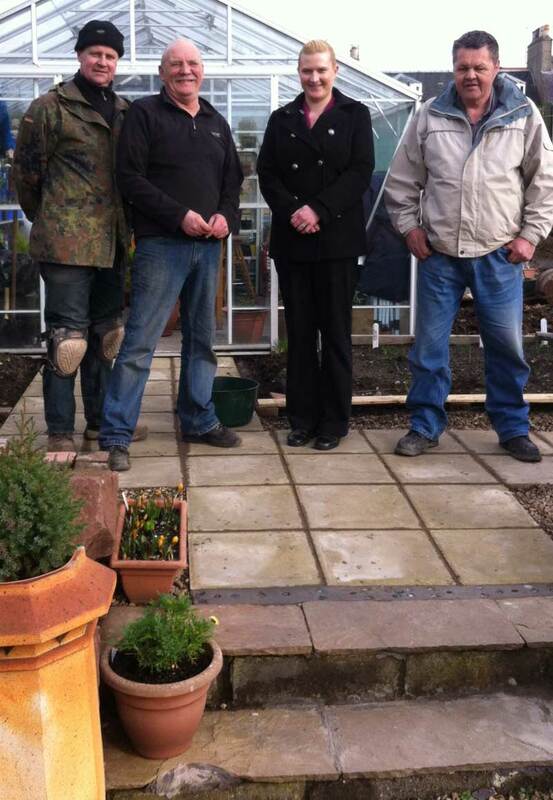 Jan Kilpatrick from Wild Tiles made her second visit to Girvan and the Community Garden last month. 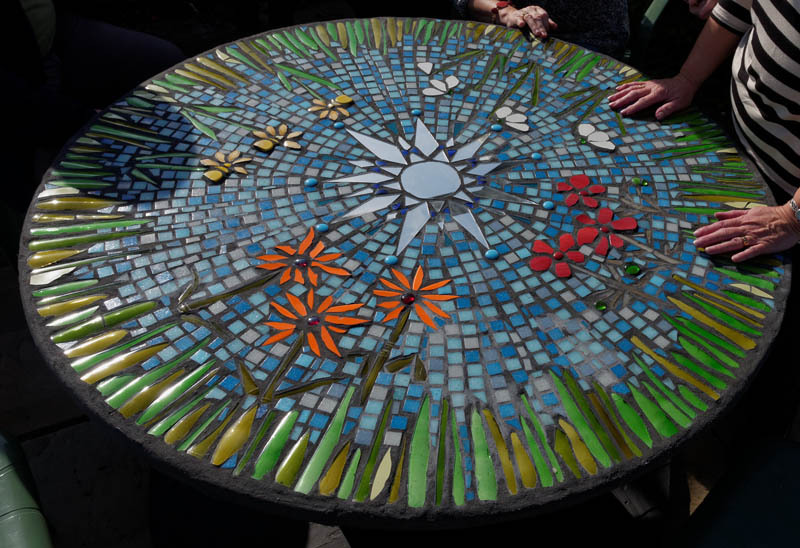 The course spanned over two days and the participants made some wonderful pieces, particularly the mosaic table top and the bird bath for the garden which already have become a huge attraction in the garden. 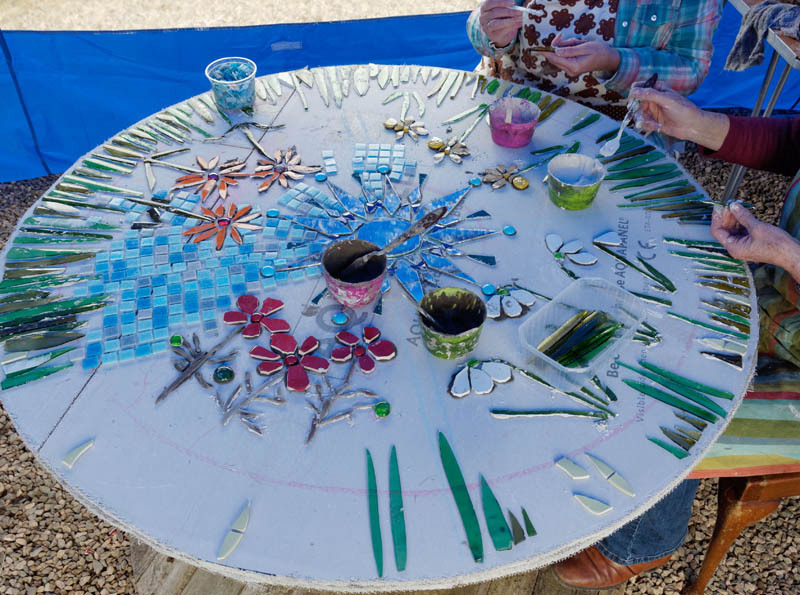 Slate tiles were also decorated by the talented bunch to take home. Our Celebration event on the 10th of August was a very busy afternoon. 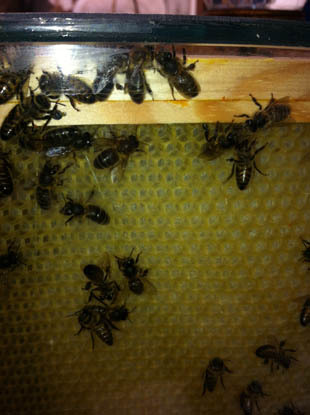 We had Ayr and District Beekeepers come along and display some of their bees and talk to visitors about their fascinating behaviour. Green Aspirations who came all the way from Glasgow to be with us had an array of green wood working activities to try which proved very popular with adults and children alike! 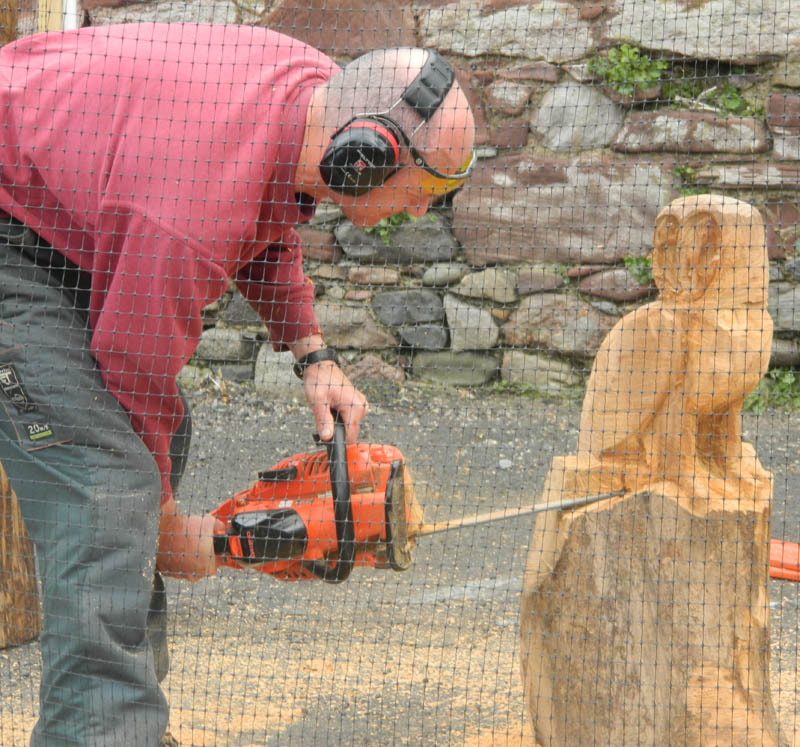 We had Ross McCreadie set up to demonstrate his chainsaw sculpting skills, some of his sculptures you can see around the garden. Rainbow Food cooked up a storm with their taster sessions in the cabin where you could take away recipes and try them out for yourself using fresh ingredients at a low cost. 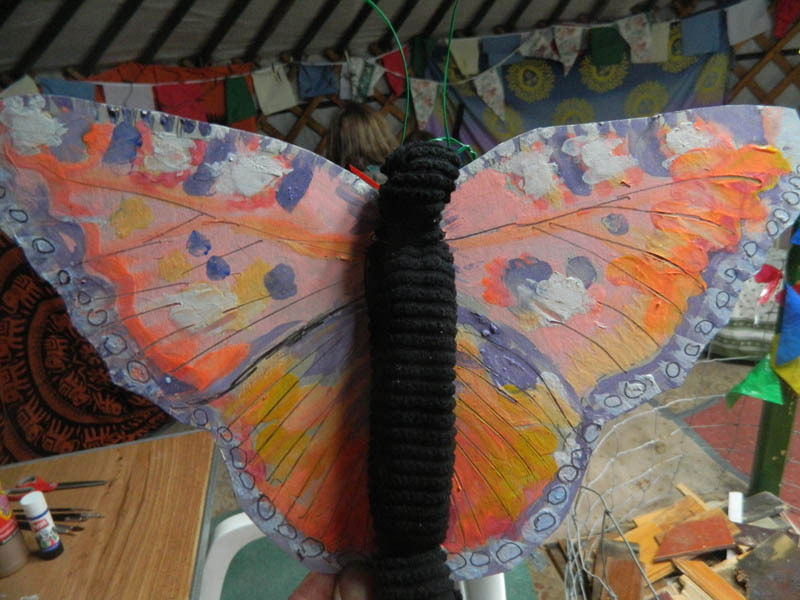 In the yurt, mum and daughter team Heather and Corrie put on their crafty hats and helped visitors make 'natural mobiles' from drift wood, shells, feathers and other found objects. A great afternoon celebrating people, food and plants! 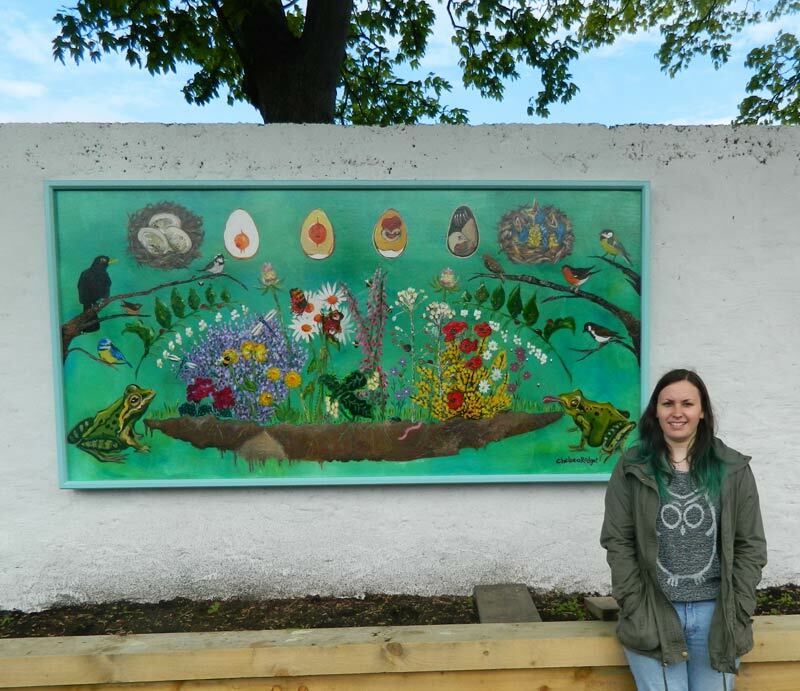 Ayr College student Chelsea Rodger has painted a wonderful wildlife scene for our south facing wall as part of her degree course. We are delighted with the result. 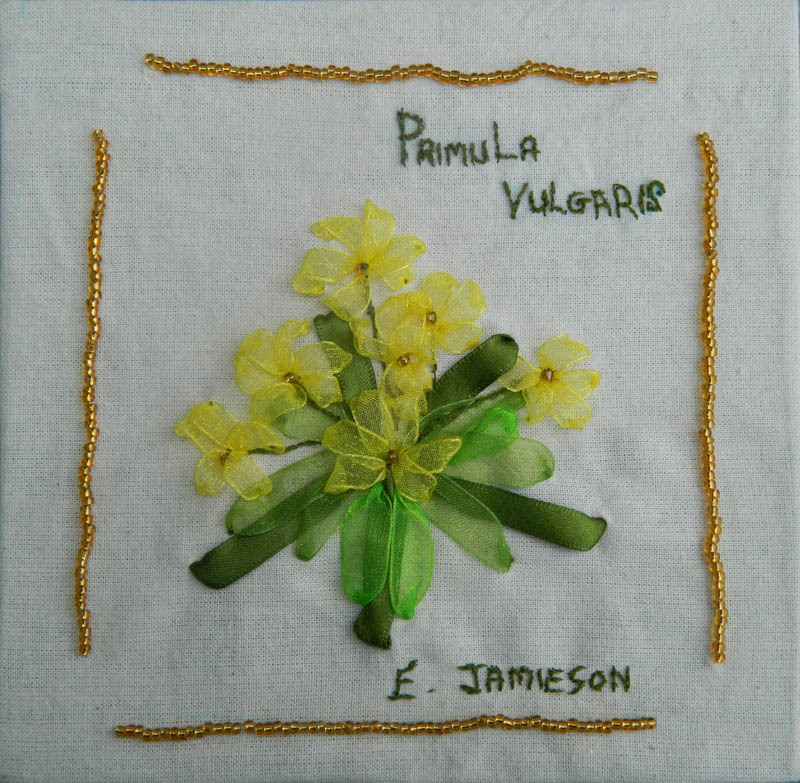 The painting depicts insects, wildflowers and many more observations in a fun and informative way. 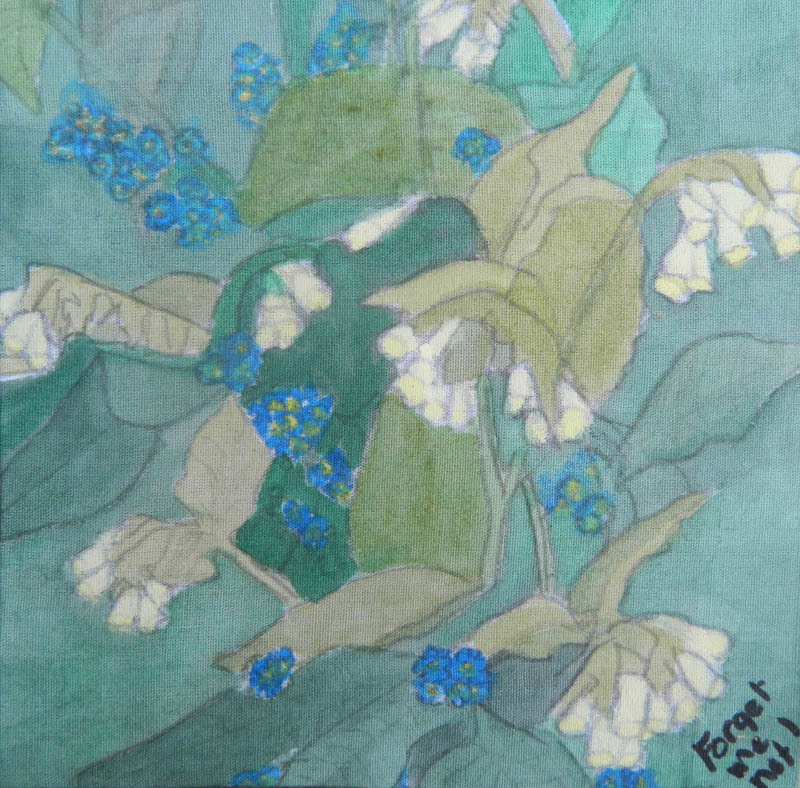 Chelsea has also designed an interactive worksheet for children to accompany her painting. We are sure it will provide lots of activity. 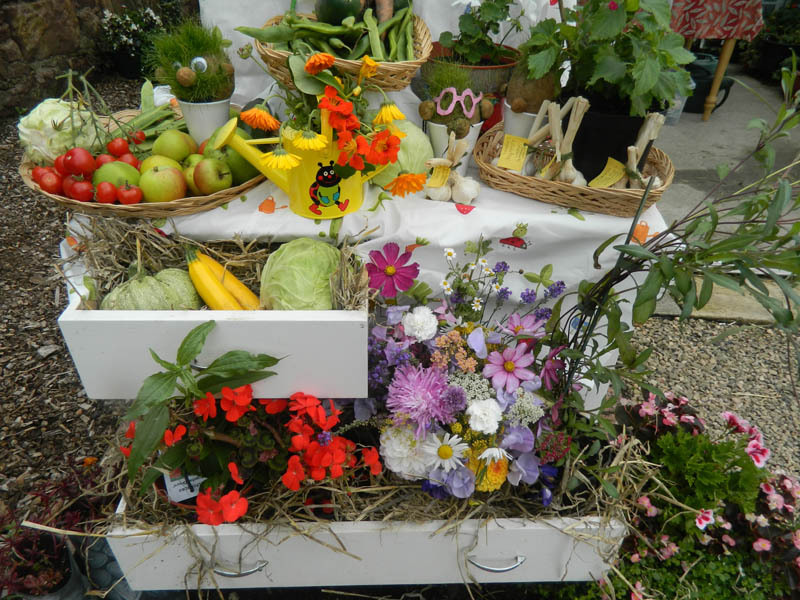 Despite the dull weather at the weekend the flowers were out and the mood was bright and cheerful at the Festival in the Garden! 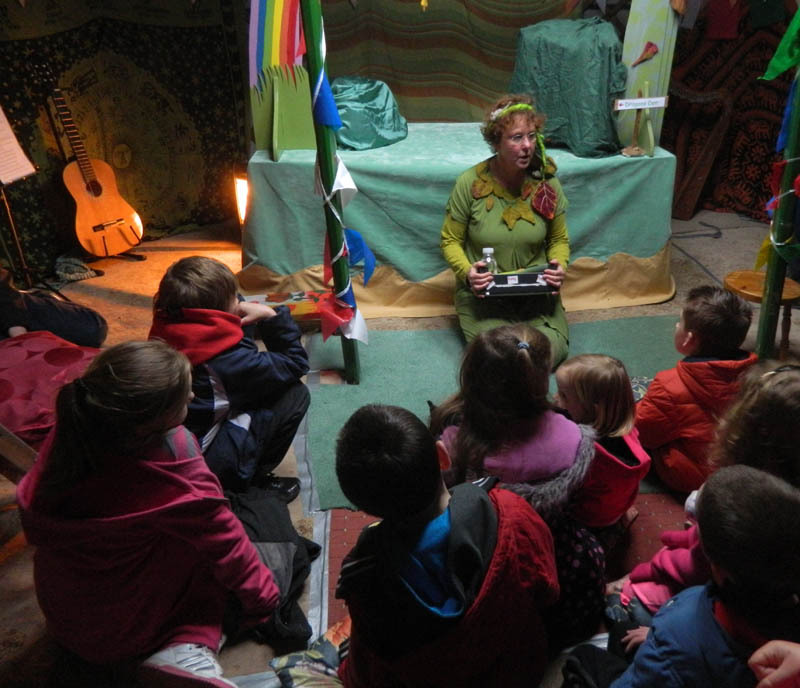 The yurt played host to many families that watched The Dragon and the Rainbow Lettuce performed by Elisabeth and her Treebadour Puppet Theatre (see our links page for their website). 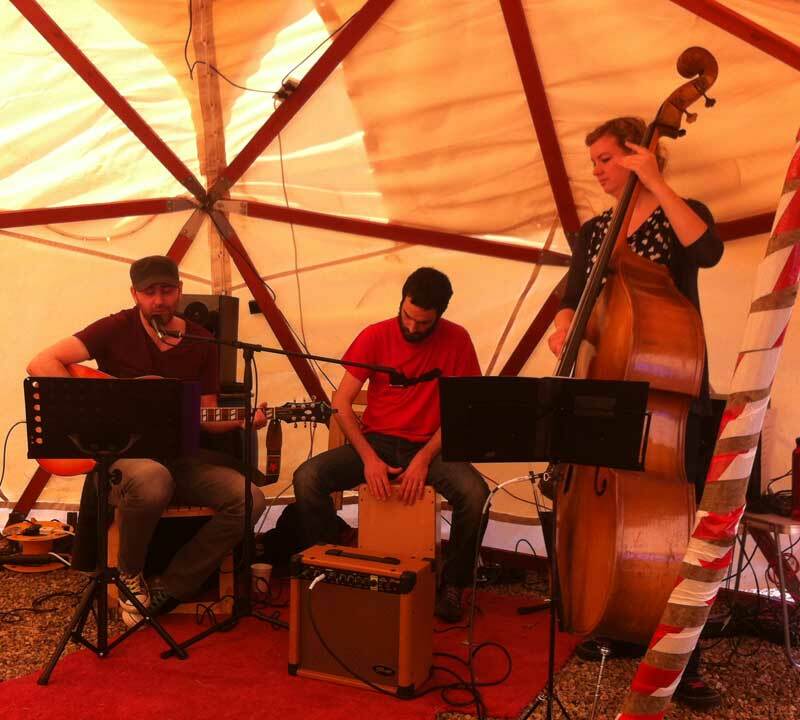 On Sunday good food and good music was the theme of the afternoon with Junkman's Choir and The Barstools singing their hearts out to an appreciative audience. 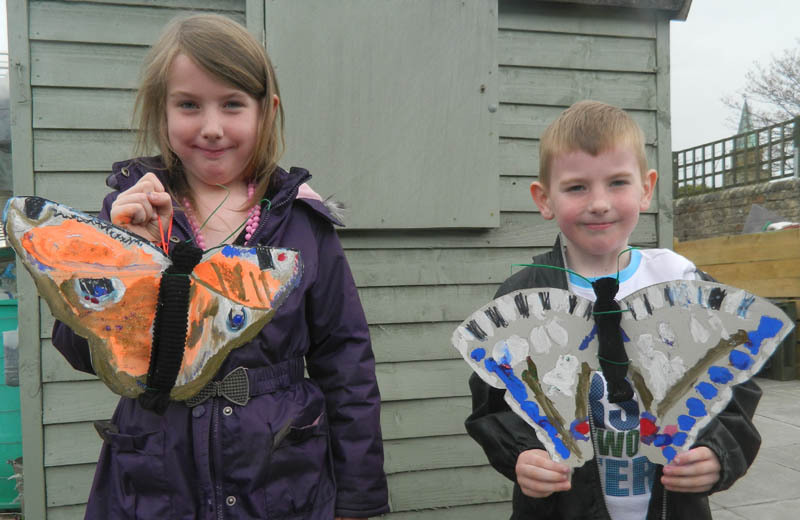 To round off the weekend a butterfly workshop took place in the yurt on Monday afternoon. A huge 'thank you' to all who volunteered and contributed to the weekend. A huge 'thank you' to Dobbies in Ayr for supporting our project. We are delighted with the plants from the centre which will be used for educational purposes as well as looking beautiful in our garden! 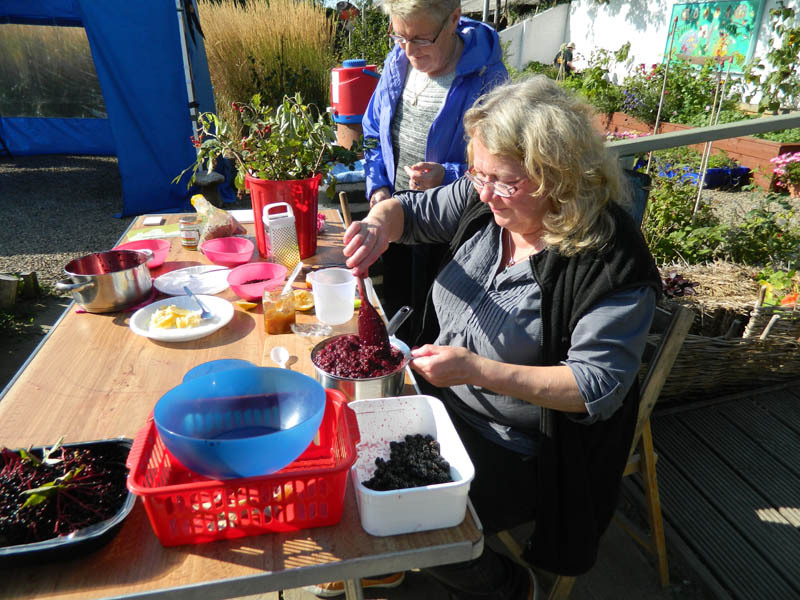 Girvan Community Garden is teaming up with the Royal Botanic Gardens in Edinburgh to take part in a new project called Talking Science - Really Wild Vegetables. We will be growing traditional, wild and F1 hybrid varieties of sea beet and radish to see how they perform in this part of Scotland. We are delighted to be taking part and can't wait to get started! Simon Duffy, the Project Manager came down to visit us last week to explain everything we needed to know. 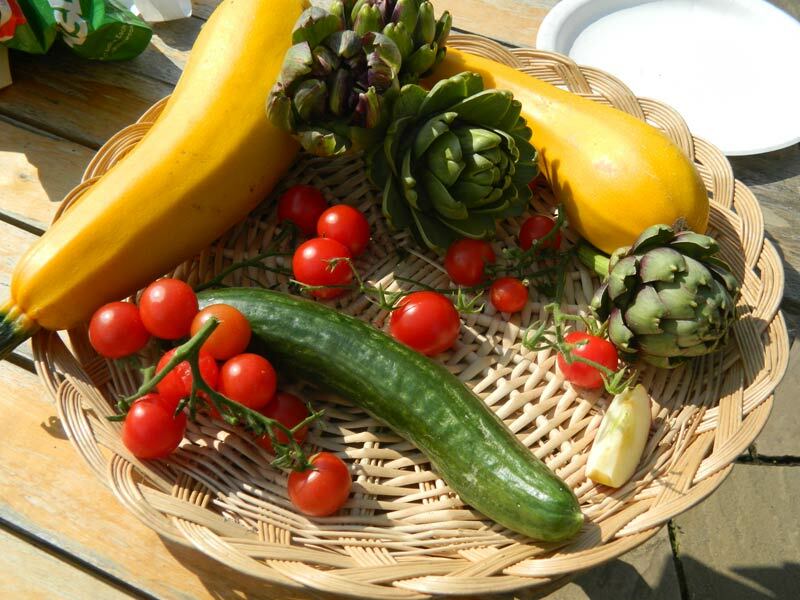 Come to the garden and see how we are getting on over the next few months. 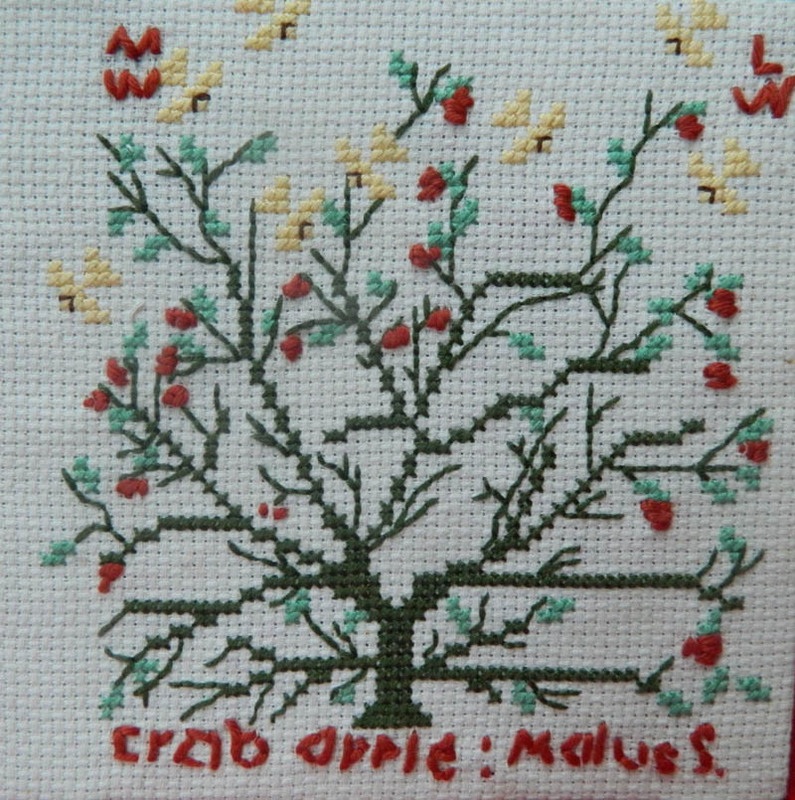 A huge thank you to those of you who contributed their squares to the Plant-life Patchwork Meadow project. They are all beautiful and all very different. Despite the horrendous weather we have been experiencing, our winter projects are now complete. 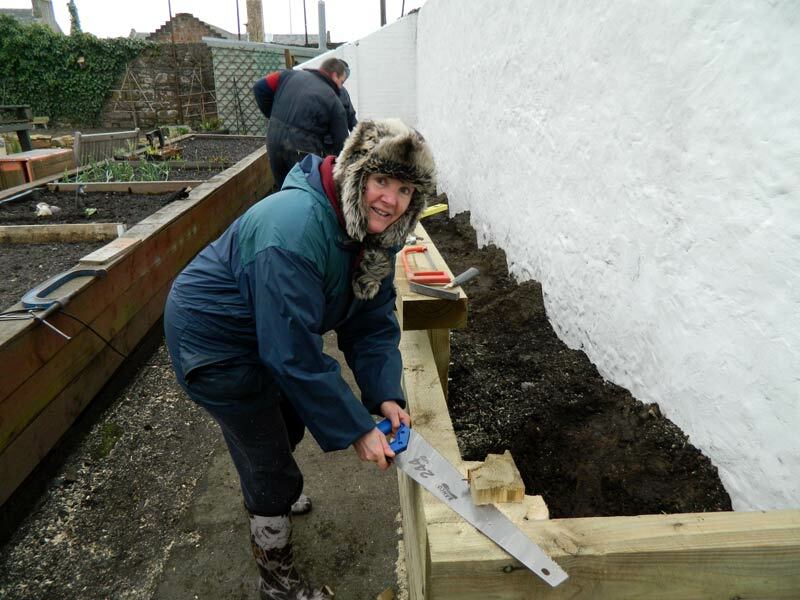 Thanks goes to our hardy volunteers who helped the contractor to revamp the new composting bays and slab laying making it much easier to manage the space. We plan to use this area for demonstrating composting techniques. We also have a fantastic south facing raised bed made from untreated sleepers. 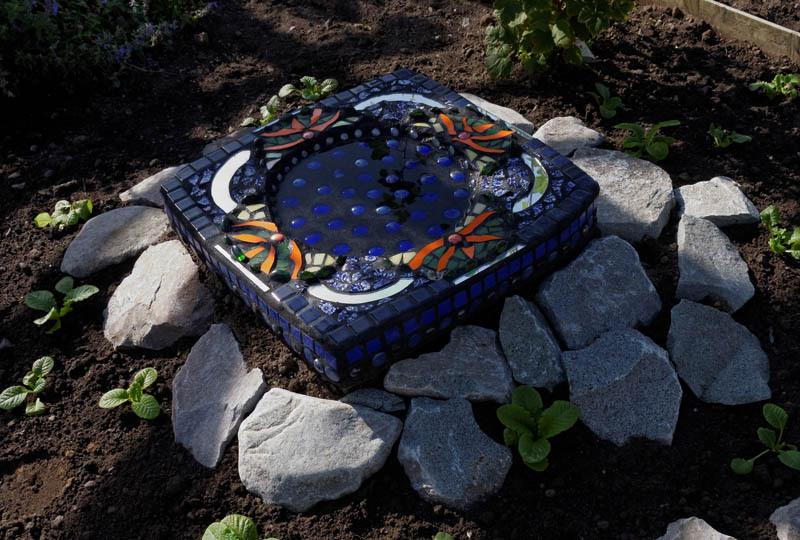 This bed will allow those who have difficulty bending or are in a wheelchair to access a growing space. The entrance pathway has been widened making it easier for visitors with prams or wheelchairs to come up the woodland walkway into the garden. 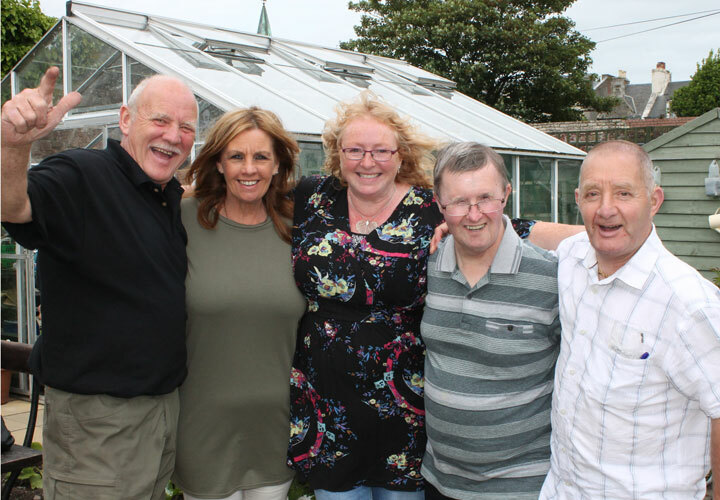 We are delighted with the developments and look forward to integrating the new facilities to become part of life in the community garden. 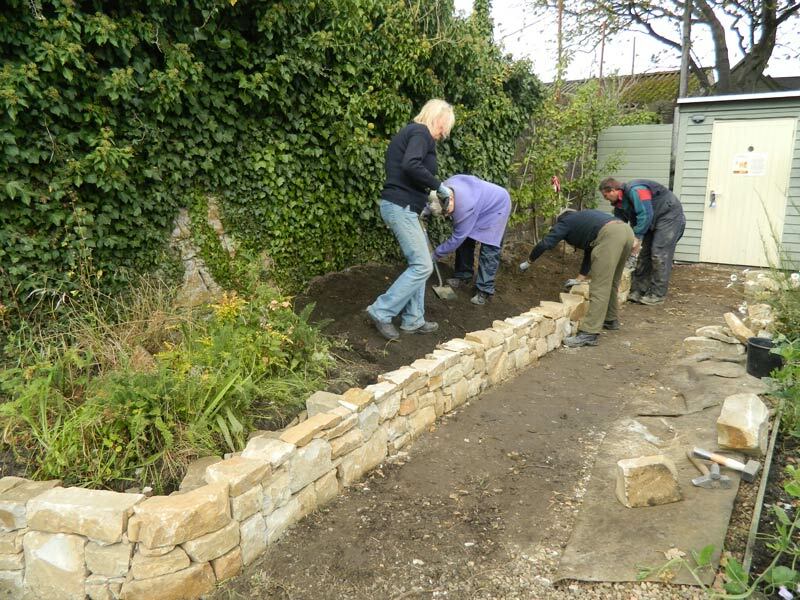 The Drystone Dyking course which took place on the 13th andf 14th of October 2012 was extremely successful. Thank you to all who took part. Everyone got on really well and worked together as a team to achieve our beautiful wall. 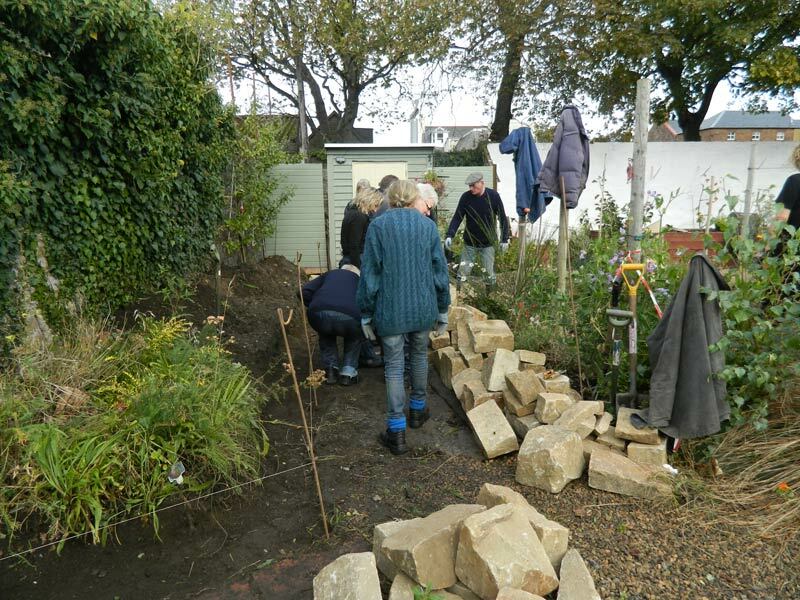 The garden was able to host this course through funding from Galloway and Southern Ayrshire Biosphere Reserve and Ayrshire Leader. Expert Alex Sharpe was there to deliver the course. 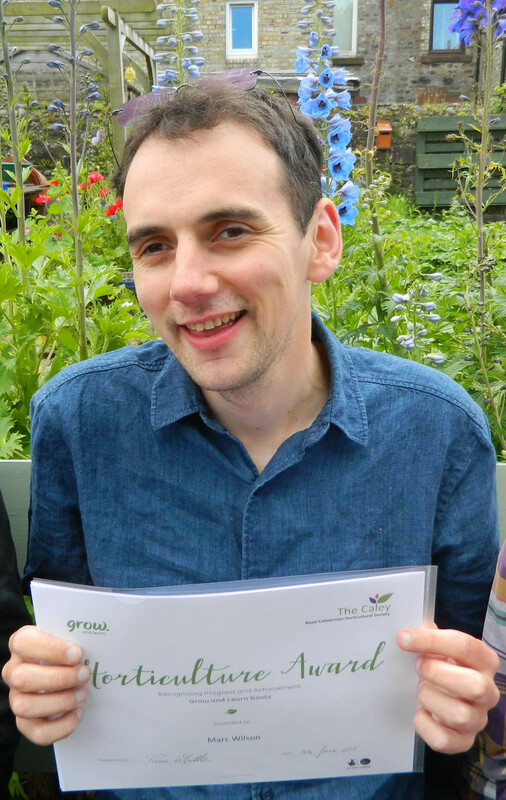 Further to this funding Alex will also be delivering this course in Ballantrae to help the residents upgrade their community garden in November. 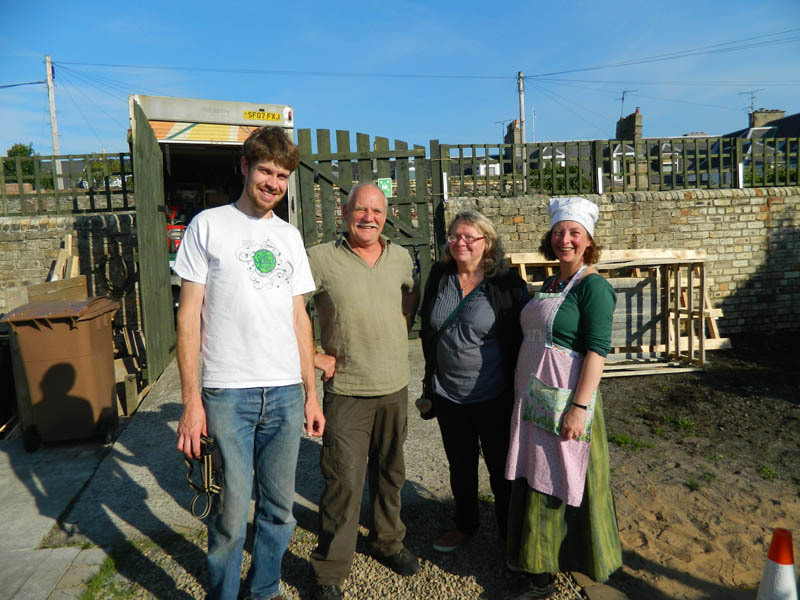 On Saturday the 15th of September the volunteers of Girvan Community Garden got together to go on a trip to The Hidden Gardens in Glasgow which is at the back of the Tramway Theatre in Albert Drive. 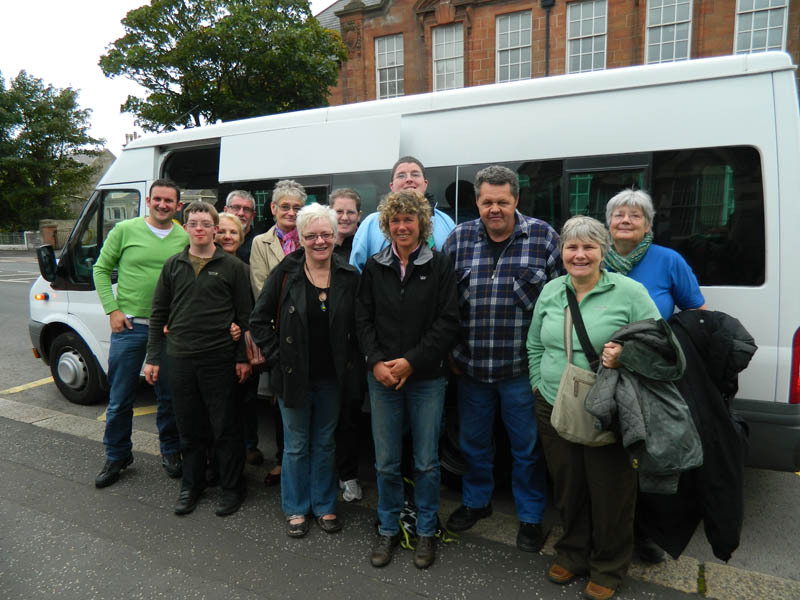 The Community Safety Department of South Ayrshire Council kindly supported our trip by providing us with a mini bus and a driver. 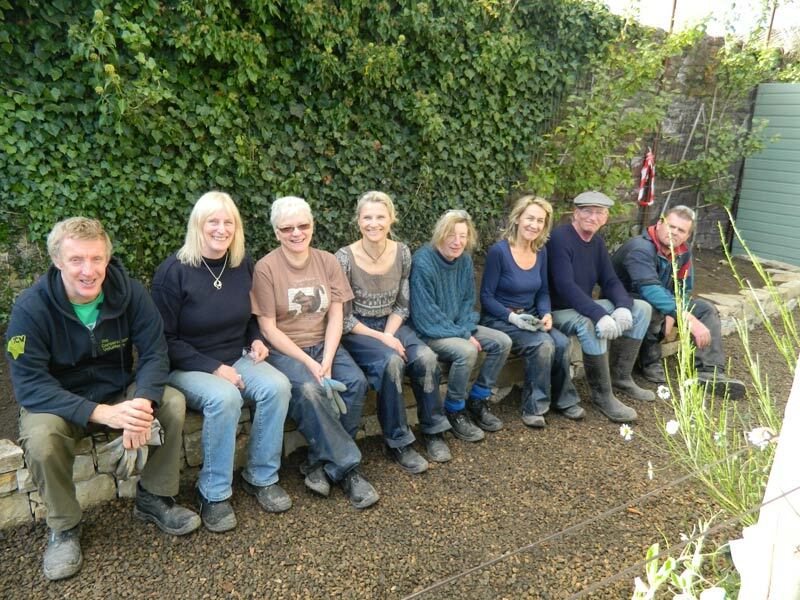 A good day was had by all and the staff and volunteers at the garden were very helpful and friendly. If you are ever in the area please go and visit this peaceful oasis which is surrounded by a very urban environment.